Question: What causes my blonde or highlighted hair to turn brassy? I hate it. It’s just not a pretty look. Good question. One any of us who have “gone blonde” ask ourselves from time to time as we struggle with this problem. Guess as it turns out going blonde doesn’t always mean more fun. Nasty brassy tones can pop up out of nowhere and throw off your entire look as you’ve seen. So I did a Pinterest deep dive to see what solutions I could turn up for reliably beating the brass. You can keep reading or if you like click any of these links to be taken directly to specific ideas uncovered. But first a good place to start might be to decide what does it mean to say your hair is brassy. Brassiness Quick Definition: Blonde hair color with a tinge or hint of yellowish orange. Can also be seen in brunettes with highlights. We could go further but let’s stick with that for now. Believe it or not there’s actually real science going on behind the scenes – and I heard that groan. But it helps to understand how coloring works to know what works to counter the brass. As you know getting to a new lighter hue from a darker brunette to something blonder requires a chemical reaction. Rather than bleaching anymore it involves “lifting”. That’s where hydrogen peroxide lifts or removes the color pigments present in your hair. Meaning more or less the underlying darker pigments are removed and replaced with lighter ones. Of course the farther you have to go to get to blonde the more apt you are to fall from pretty blonde to unwanted brassiness sooner than you’d like. Also if your natural color pigments are not lifted out of your strands properly once again brass onset is more likely. So enough already with the background. Let’s get to the reason you’re here. Because if you’ve ever dyed your hair blonde you know the inconvenient truth. It doesn’t take long for the color you walk out of the salon with to be overshadowed. The good news is you can often banish the brass at home and keep your blonde looking stunning every day. I found a lot of solutions on Pinterest posted by beauty bloggers – some that seemed more likely to work well than others. Given that, you’re going to obviously want to take it slow since it’s YOUR hair we’re talking about. Let’s start with a common solution. The standard first trick out of the colorists’ bag of tricks is purple shampoo. Many feel it’s the best way to rid your mane of brassiness. Here’s stylcaster’s take on purple shampoo or what you might call Hair Color Science 101. So that nicely explains what’s going on. The color responsible for keeping brass in check, blue, leaches out first allowing brassiness to raise its ugly head. Seems the lighter blonde you go the less optional purple shampoo it becomes. Now you likely want a darker purple colored shampoo rather than something more lavender-ish. Because that means you’re putting more color pigment to work on the problem. How you use it differs by what you’ve got hair color wise. All over blondes require application concentrated on the roots. Letting it run down your strands should suffice for the ends. Those with blonde highlights want to restrict this shampoo to the lightened section of strands – cleansing the rest of their hair with ordinary shampoo. How long you leave it on requires some experimenting too. If you’ve got bad brass you might want to see what leaving it sit for four to five minutes does. A less intense problem may only require a minute or so under the purple. Just so you know this isn’t a permanent fix for cooling down those gold, yellow or orange tones. Nor is it what you’d call an exact science. Some lather up with the purple almost daily. Others find once a week works best with their hair type and amount of yellow they are combating. So yeah, you have to play around with the color purple. Alternate lathering up with it for a couple days then using your fav suds for a couple until you find the frequency that produces the best result for your hair. If your color goes a bit too ashy, well, just slow your roll using it less often. Another idea would be dilute the purple into your regular shampoo and use that mixture instead to produce a consistent outcome. Also should mention the other downside. You want to make sure to rinse it out completely. Residue left behind can change your hair color in other ways, and you thought orange was a problem? As you can see this is powerful stuff so you might want to be a bit cautious the first time you unleash it into your shower. But the difference in your color can be nothing short of amazing. You may even get to the point where you can tell who does or who does not use it when pushing your shopping cart at the grocery. Okay so so much for the first choice. The next solution for your pain-in-the-brass involves plumbing. Depending on the chlorine situation in your city water your daily shower could be culprit. That or iron from say well water. Either or both could be reacting badly to create an undesirable mellow yellow effect in your mane. This is why some stick a decent shower filter on to extract the chemicals before they make contact with your precious tresses. No contact no brass. Simple. A quick check of Amazon showed a highly rated shower head by Culligan would set you back less than $30. Not much to pay for care free orange free showering, now is it? Toner is a useful little demi-permanent color that some know as a gloss. 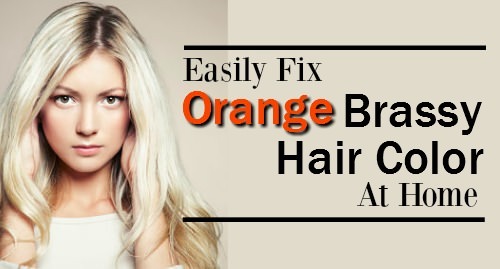 It too works to nullify those brassy orange and yellow tones your colored locks have picked up. That way you end up with more brightness while extending the life of the color. Typically tinted purple blue, sound familiar?, it helps to restore your strands to a more natural looking cooler silvery or ashy hue. Now even though they have the power to change pigment, toners primarily affect the undertones of your blonde hair color. They are not designed to lift the shade. It’s also not the cure all some make it out to be. If you’ve got blonde hair with a yellow cast to it toner is the product to fix that. Orange on the other hand, not so much. If you don’t feel comfortable doing this yourself, I’m sure your stylist would be glad to help out. Using products for color treated hair that don’t go heavy on the violet are an important part of any “brassiness bashing” routine – including yours. These will help to keep those locks of yours hydrated, healthy and stuck in high gloss mode too. Not to mention keep your mane from overdosing on the color purple. So if you don’t want your blondelicious bliss coming to a premature end just look for products with the magic words – for “color treated hair” emblazoned on the label. Okay so those are the typical ways we can offset the onset of brassiness we all dread and get your color looking all fabulous again. Of course you can try applying blue mixed with red koolaid, food coloring, lemon juice and such to tone down the brass in your hair. Just understand doing so may also produce mixed results. But one last cure for the tonal problems to mention that come with going blonde would be Manic Panic. Here’s a quick video that explains the process. All you need is two ingredients to make a potent brass banishing hair mask. The conditioner is used as a base for the hair mask. To that you want to add the Manic Panic. The trick is correctly judging the amount of Manic Panic needed. Key Takeaway: Take it slow. Don’t overdo the Manic Panic as you can’t easily undo it. You can always repeat the process but reversing it is harder. Once you’re satisfied with the color of the blend apply the mix of conditioner and Manic Panic to the parts of your hair you need to fix using a tint brush. Again notice she did NOT applying this over all of her hair, just the colored portions. Also make sure you don’t miss any sections. The Manic Panic color used here is as close to perfect as you can get. You guessed it. A deep indigo rules much like with purple shampoo producing much the same outcome. This home brewed toner mix cancels out those unsightly brassy yellows distorting your beautiful blonde. You’re also painting with semi permanent hair color here. In this case it coats your strands to modify the appearance of the shade. Yes, over time that coating will wash off. Don’t panic just repeat. I thought the idea of using conditioner to deliver the brass offsetting color was genius. Giving two reasons for your hair looking better after than before – less brass and more silkiness. If you aren’t careful you’ll be left with color so hot you’re at risk of spontaneous combustion. Hopefully something here answers the questions you may have had about brassiness and blondes. Because, and I can’t take credit for this line, when it comes to our hair, orange is definitely not the new black. If you want more stand out coloring ideas that are both pretty and practical be sure to follow our hair color board on Pinterest.